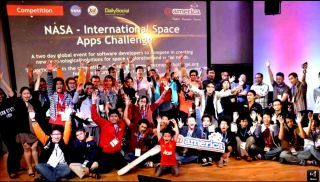 A group of enthusiastic participants in the International Space Apps Challenge, a yearly, weekend-long global hackathon. Today (April 10) marks the start of the International Space Apps Challenge, a global hackathon open to anyone with an Internet connection that aims to use data from NASA and other space organizations to solve real-world problems. Participants in the International Space Apps Challenge are tasked with creating mobile applications, software, hardware, data visualization tools and platforms that either take on one of the "challenges" created by NASA or tackle unique projects. In anticipation of this weekend's event, Space.com talked with one of the Space Apps Challenge creators: technologist and developer Sean Herron. We asked Herron about where the idea for the challenge came from, what the weekend-long event is like in different parts of the world and how people of many different skill levels can participate. Space.com: How did you and your colleagues at NASA came up with the idea for the International Space Apps Challenge? Sean Herron: We were thinking about how there's this huge mass of people all around the world who are just incredible fans of NASA and space in general. And [we saw] all these amazing things that come out on the Internet all the time, of people doing just great stuff with data collected from NASA missions. And our thought was, would there be a really cool way to kind of tap all of this genius and bring them together, and have one big event to try and solve what we call "problems of a global nature?" So, what if we got the best and brightest inside of NASA to say, "These are challenges that NASA has in various areas — from climate change, to ways of doing human space flight on long-duration missions, to all these different areas." What if we drafted some very small challenges, very small pieces of those larger problems, and put them to that collective consciousness for a weekend and just see what they came up with? And so that was the initial impetus behind the idea. And we hosted the first event back in 2012, where we ended up bringing together I think 70 countries around the world, with thousands of people coming together, working on a whole bunch of challenges that had been inspired by NASA missions. And it was really amazing to see what came out of that. Space.com: The challenge is something people can do from home, or they can go to event centers in over 130 cities all over the world. Which events have you been able to attend, and what are they like? Herron: I was extremely fortunate. In 2012 I was able to go to Nairobi, Kenya, and attend the event, which was at the iHub, which is this amazing technology center in Nairobi where they're bringing together all of these different technologists and developers, some of whom are working for big names like Google and others who are just independent folks working on their own projects. So there was a lot of work going on that embraced that local talent to see what could be done with the "Sounds [from Interstellar] Space" collection that NASA had, where you're getting all these sounds from various missions like [the Solar Dynamics Observatory], and to see if there could be interesting visualizations done with that data and things like that. Space.com: If someone hears about this and is interested in doing it, is it something that a newbie can jump into? What advice would you give to someone coming at this for the first time? Herron: Sure. There are these NASA "suggested challenges," which are things that have been curated by NASA — these are real-world needs that have been voiced by someone inside of NASA — and those have been created at a variety of difficulty levels. So you may have some that are very easy, very simple, that someone who is new to development or new to space in general can grasp fairly easily and participate in. There are also more complicated things that normally require some subject matter expertise or require specific domain knowledge in an area. So there's definitely a good mix of challenges in general that tend to address people of all skill levels. A big focus was making sure there are challenges that aren't just focused on technology, but maybe design challenges, or policy challenges or culture challenges. So even if you aren't someone with a background in a particular area of research or you aren't a developer who is fluent in five or six programming languages or something like that, there are definitely other areas where you can participate and enjoy the event. Space.com: How do you think the Space Apps Challenge is unique among hackathons, or what has it done differently? Herron: Definitely we weren't the ones who invented hackathons. There have been many, many successful hackathons that came before the Space Apps Challenge. But I think to some extent the Space Apps Challenge was the first example of an event where you had a government organization — someone that has a really big name brand, not just among technologists but among the entire world — coming together and putting their weight behind this. Saying this is something that has value and this is something that's really important to our mission. So that was kind of one aspect that I think made the Space Apps Challenge new and different. And the other was the sheer scale at which it was done. Most hackathons are focused at one location. Normally they're in San Francisco or New York, where they bring together developers to do very targeted, specific things. The Space Apps challenge kind of turned that upside down. We said we're going to open it up to anyone on the entire planet. We're going to have locations across the entire planet, and we're going to have the ability for people to join in remotely. And we're really going to encourage collaboration and sharing among participants as they work together on this. Which is not kind of the traditional hackathon model at all. In fact, traditionally hackathons are competitions or are focused on finding the one person who has the best idea and giving them a prize and everyone else losing to them. And the Space Apps Challenge was not about that at all. We really tried to emphasize communication, collaboration and sharing of ideas to enhance everyone's collective knowledge and enjoyment of the experience.